Today, she was a poet, for she lived many lives, today. She moved around the world and she remained still to watch the world move. She lived between the lines of the novel she carried. The washed out sky cooled to hues of the brightest blue, spackled with cotton-candy clouds, white as snow atop the peaks of the Andes, and highlighted by the blushing sun calling close only to the day, as life was just beginning. Alone, she rested atop Salta Bossetti. The tourists, they moved around the falls. But she remained still, her only movement being the beating of her heart, the rise and fall of her chest with each inhalation of fresh air, and her hand, guiding this pen. Her body and mind were still, calm. Her soul felt peace, in paradise. "So this is what heaven feels like," her thoughts spoke to her. "I only hope my mortal sins can be forgiven so that I may embrace such beauty again." Her thoughts dispersed with the mist and her soul grew as strong as the current, releasing from its sources and being affected by every piece of Earth over which it flowed. She remained on the upper pass, in solitude, reading the most magnificent travel guide. Henry Biernacki's No More Heroes is more than a novel. Though the places are real, you will not be led to the best local beer, but rather engaged in conversation until you find your own heart. 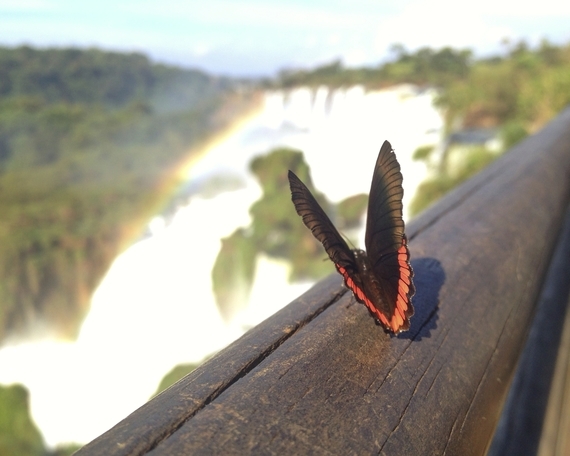 She found herself at Iguazu. Her steps, each day, brought her deeper into this place. In the city, the echo of her flip-flops marked her as a foreigner in a land entering winter. Changing to the softer tap of a flat and flexible sole improved her blending as a local. But it was not until she slipped everything off and buried her muddy toes in the sand that she bonded with her place in this world. Removing her shoes, she felt the midday heat beneath the soles of her feet, resting on the hot stone, while the golden orb's beating rays stained her skin. Sitting barefoot, she felt more than she saw while moving. She listened to the crash of the water at the foot of the falls and the rolling of the rapids. Closing her eyes, she breathed in the green rainforest releasing water into the river, tasting the crispness of fresh, unpolluted air, softened by the humidity. The moist air and sailing mist left on her droplets of water that magnified each grain of sand stuck to her skin. The rivers, they experience immense pressure, colliding and letting go, falling and joining closer, tighter. The water, kissed by the sun, waves with each reflection of its ripples. The union of the rivers is celebrated with the dance of the butterflies, while the mist shrouds its intimacy from watchful eyes. "You can make money, but not nature," she read from the novel, authored by her friend whose soul shares an enchanting interest in this world. Looking up from the pages, she met Pache, a worn vagabond with dreadlocks who cannot determine if he is a local or a traveler. Perhaps there is no difference, if a piece of the heart is shared. "Everything I need is within me," he told her how he has no worries about money, not even a roof over his head. "No plans," he explained, "I go to the airport and I take a flight." She was living the novel. The people she met, they are all characters. They all have a story, but the ideas, the ideas are mirrored across borders. The ones who affect her story, they transcend all time and place. 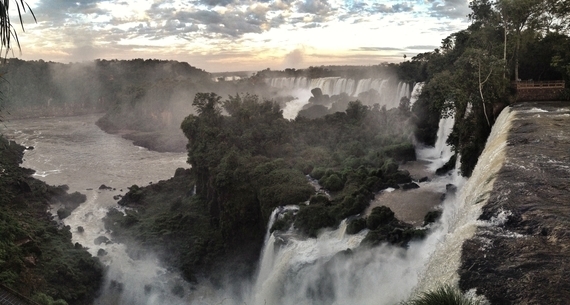 Her paradise, today, it was Iguazu. His was in the Himalayan Mountains of Nepal. But any destination is remembered through the company one keeps with others and with oneself. Like the rainbows arching over the falls, she and others are bridges. The beginning and end of the colors are blurred, and sometimes entirely undefined, as they appear to touch the Earth, but the order of hues is constant, highlighting similarities no matter the point of observation. As dusk descended upon the falls, she passed a cable car loaded with tourists, and was reminded of a recurring choice: to be driven down a path or to take movement on her own accord. She walked on, the chatter of herds of humans fading behind her. Emerging from the canopy of forest to an open field, the warm sun was taking rest below the horizon of tall grass blanketing the Earth. She turned, taking a moment to look back and remember from where she came. Bidding farewell to the day, she kissed her hand and released to the falls.